You might remember that several months ago we bought an old door to replace our front door. It was quite a process getting to this point, but the new front door is in and our front porch mini makeover is complete! 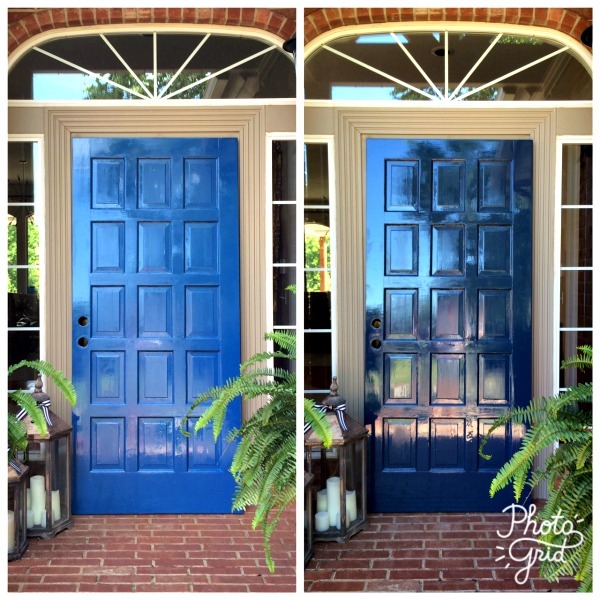 As a reminder, here's what the door looked like when we bought it- one side painted with multiple colors and the back side stained. After much patching and filling in, sanding, paint stripping, and re-painting, it's finally exactly what I had pictured. Well, almost. 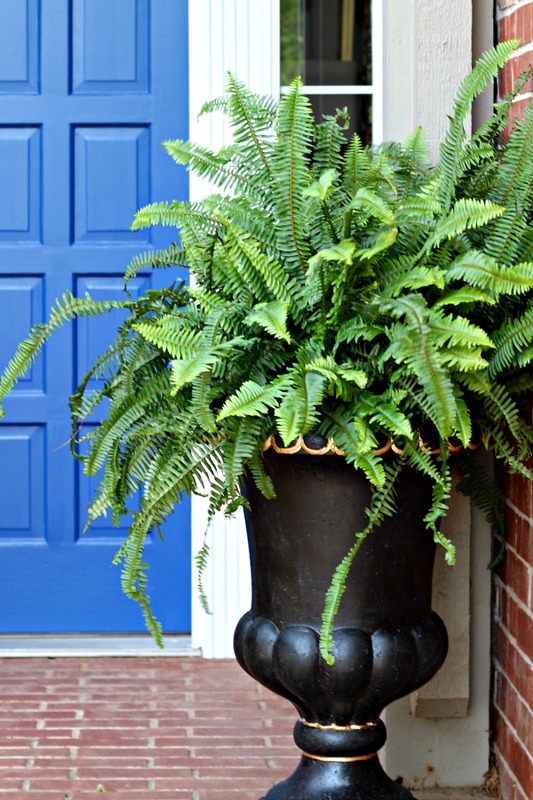 I wanted a brass door knocker too but it doesn't really work with this style of door. That's ok, though. I'm loving the simplicity of it. (if you follow me on Instagram and saw my stories you know what I'm talking about!) I started off with a super glossy paint that I thought would look fantastic. Strike one. Once on the porch the color wasn't what I had in mind, and I was having trouble getting the glossy sheen to dry properly. So, I darkened up the paint a little and it was better, actually a pretty blue/gray color, but it still wasn't the color I had in mind and the gloss was still a bit uneven. And, I realized when we leaned the door up for a test run that the gloss didn't look right. I've seen some beautiful lacquered front doors, but this one wasn't working for me. Strike two. Here are the first two attempts- it's hard to tell in the first one but the color was much brighter-almost turquoise- in real life. I scrapped the glossy plan and started completely over with a new shade. 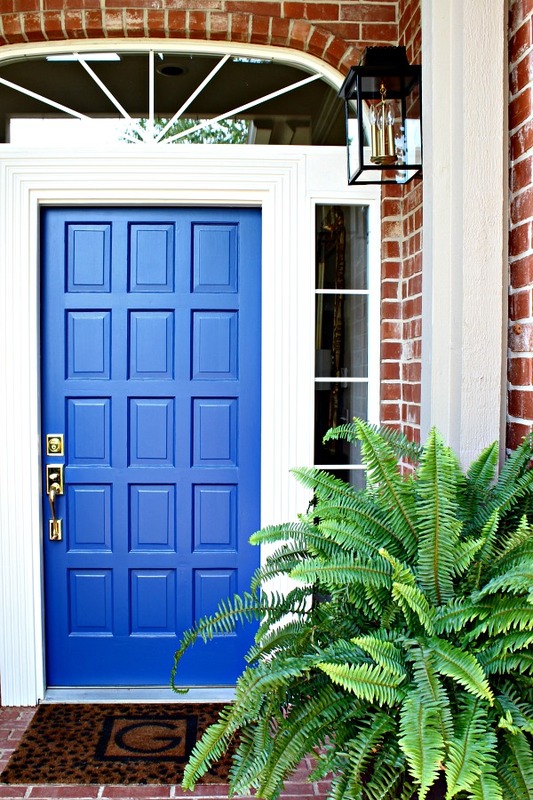 I chose Dignity Blue from Sherwin Williams and had it mixed in a satin finish, then held my breath as I painted the door for the third time (actually it seemed like about the 20th time counting all of the primer coats and mistake coats!). The third time was the charm, because now the door was exactly what I had in mind. The perfect shade! Our porch is always shaded so I love how the pop of color brightens everything up. A new brass handleset finished it off nicely. We're debating adding a brass kick plate at some point, but we'll see. I will let you know that changing out the door was not as easy as we had hoped. It was a tad too tall so it needed to be trimmed, which was no big deal. However, the handle and lock position did not match up to where the previous ones fit into the door frame (not even close), so we had to hire someone to replace the entire door jamb and refit things for the new door. Even with that, we still came out much better than buying a new door would have been. 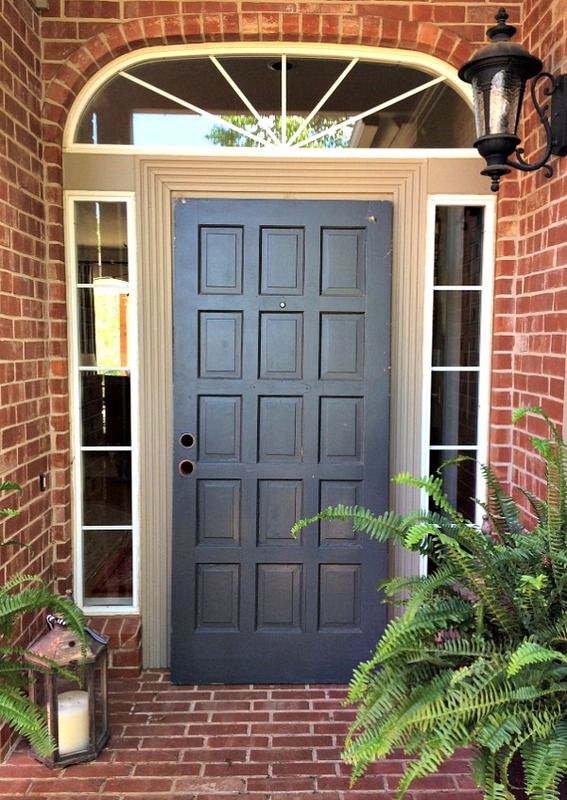 This old door still has a quirk or two and isn't perfect, but it's charming and we're happy with the change. While we were at it we also switched out the exterior porch light. 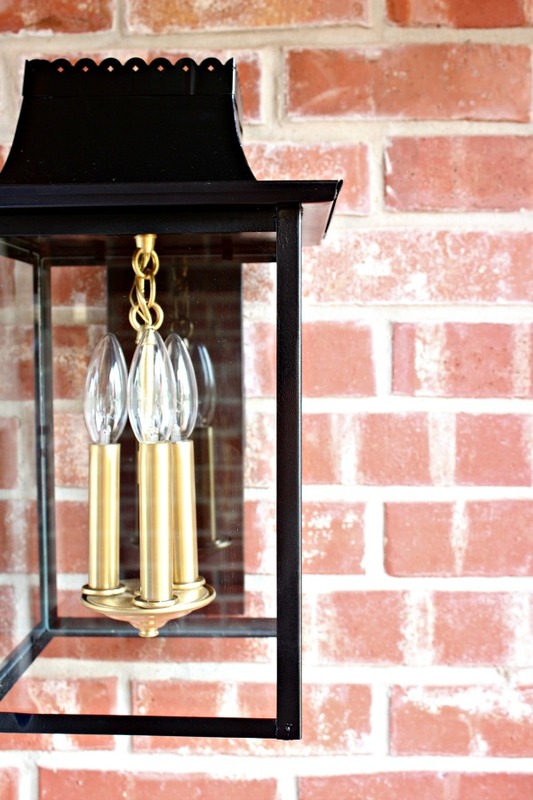 I bought this light several years ago from a thrift store in Dallas for a whopping 89 cents I think. I completely forgot to take a before shot (well I did, but I posted it on my IG Stories and forgot to save it, so it was gone in a day), but the finish was goldish and damaged and there was no glass. I ended up with about $50 in it by the time I painted it and replaced the glass, candle sleeves, and bulbs. Well worth it! That scalloped detail across the top is what did me in and made it impossible for me to pass it up, even in it's sad condition. I've had these urns for several years, but just added some gold detail like I did on my old concrete planters years ago. This is my favorite gold paint to use for projects like this, it covers extremely well in just one coat and holds up well. It's hard to tell in the photos unless you look closely, but I painted the trim around the door the same white as our patio trim. We're planning to get the house painted soon and I wanted to test the color, and I also like the crisper warm white against the door than the tan trim. And with a pretty new update! 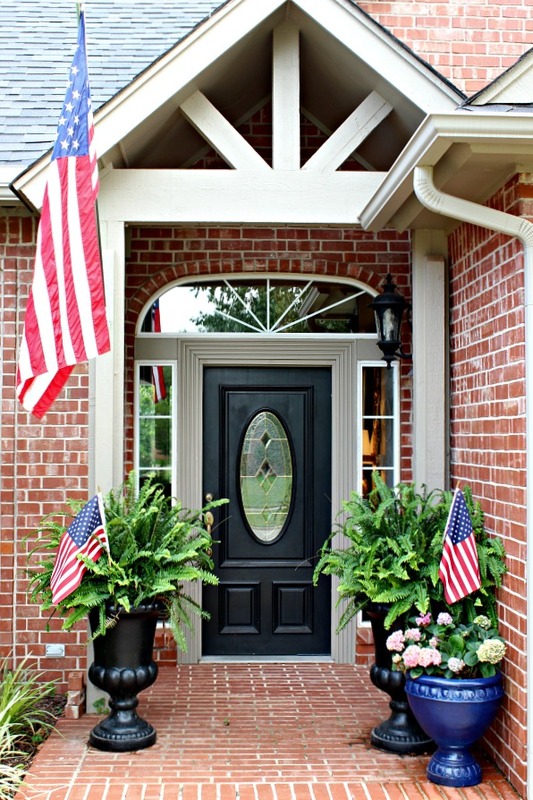 I was definitely inspired by all of the beautiful front doors that we saw on our trip to London several years ago. This one makes me happy and reminds me of that wonderful trip every time we arrive home now! It looks fantastic Jennifer. 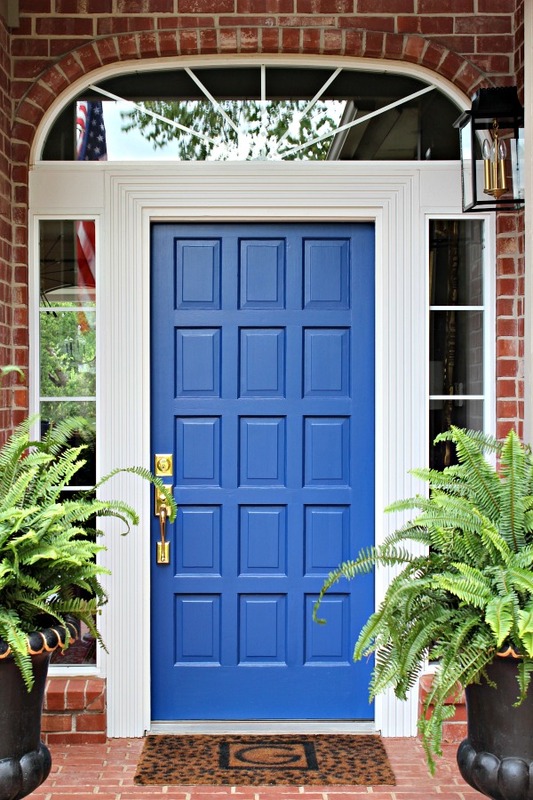 Love the pop of color it adds to your exterior. it was a beast but well worth it! looks totally amazing!!!! That's my favorite shade of blue! It all looks so welcoming and fresh. Great job! Fantastic! 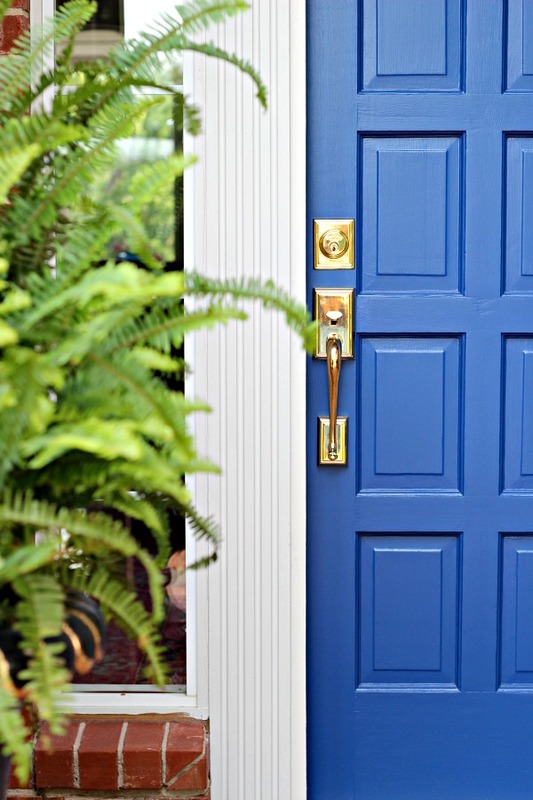 When we painted our front door blue we installed a brass kickplate which was the icing on the top! HOWEVER, birds kept pecking at it because they see their reflection. Now I have to cover the plate with brown craft paper and train the birds to go away! Who knew? 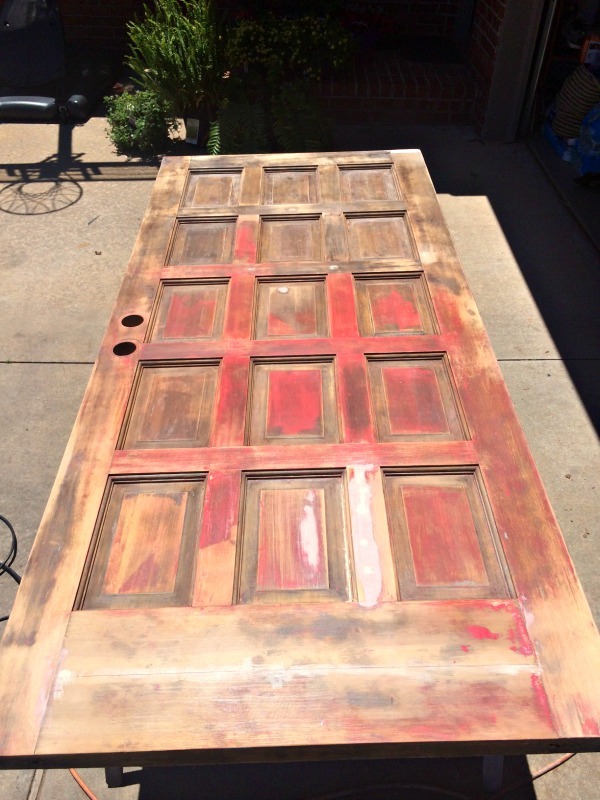 I just love that you found a thrift door and made it beautiful! Thanks for sharing that it took a few tries too... It's good to read that others make mistakes too when DIYing. What a pretty update! It looks great. It looks SOOOOOOOOOO pretty! I absolutely love it! 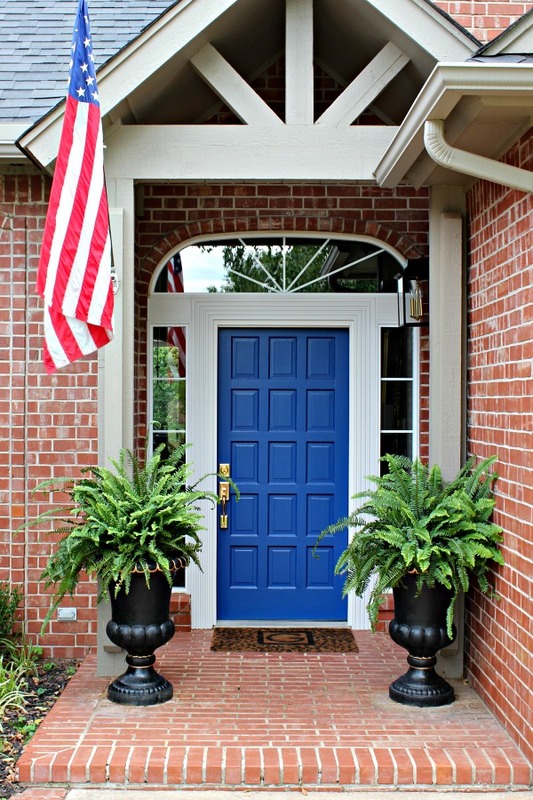 The new door really updates your beautiful home. The color you chose is perfection! You worked SO hard on this and it looks beautiful!! 👏🏻👏🏻👏🏻 Great job!! 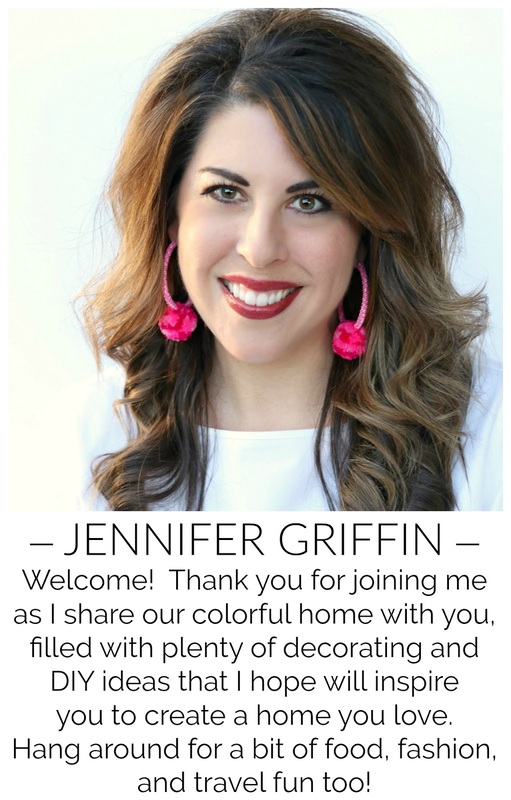 Jennifer, your door looks amazing! I've been watching all of your hard work and I have to say you really did hang in there. Your hard work was worth it. The blue is bright and welcoming. 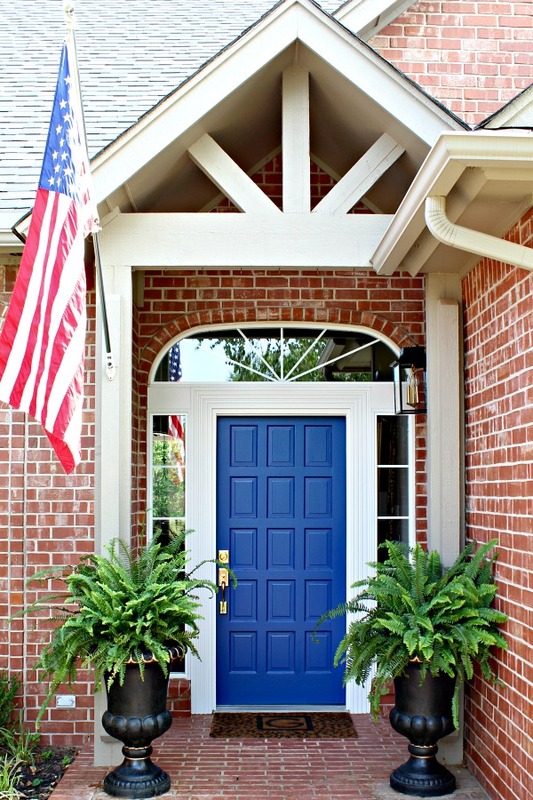 Love he blue door and the porch! I love it!! Great job! Great job. 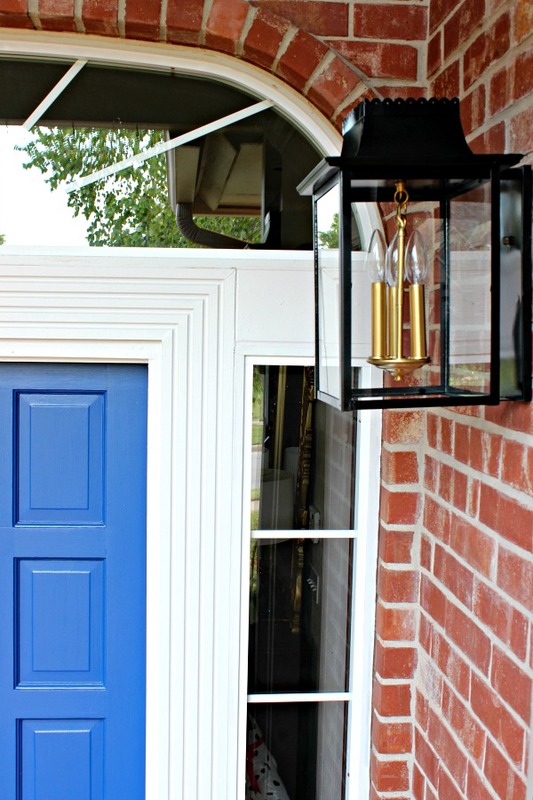 I'm just curious, what type of paint did you use to paint that outdoor light fixture? I love the color of blue you chose. It really makes everything pop. Definitely add the brass kick plate. It's that extra little something to dress up your home. I have the same door on my house(original to the house built almost 40 years ago) but we were in desperate need of extra light in the entry and living room because the front of the house is in the shade all day. We looked at doors with windows but they were so flimsy so we had glass added to the top six panels. We love it! And believe me when I say these doors are SOLID wood. Jennifer you have such great vision. 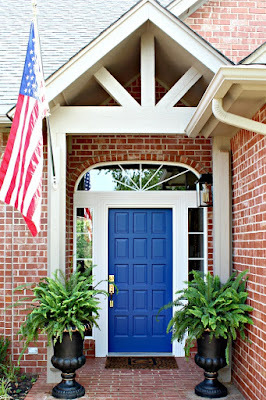 After all your hard work this door came out beautifully - I love the style and the color!!!! And the new hardware!! 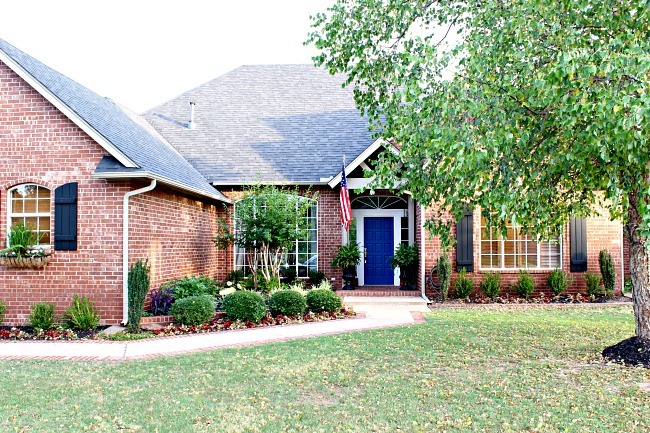 It looks amazing with the white trim, brick and black shutters! Hi, it was Rustoleum Protective Enamel, and the colors are premixed. There are several to choose from. Love this paint on furniture! i like this home .